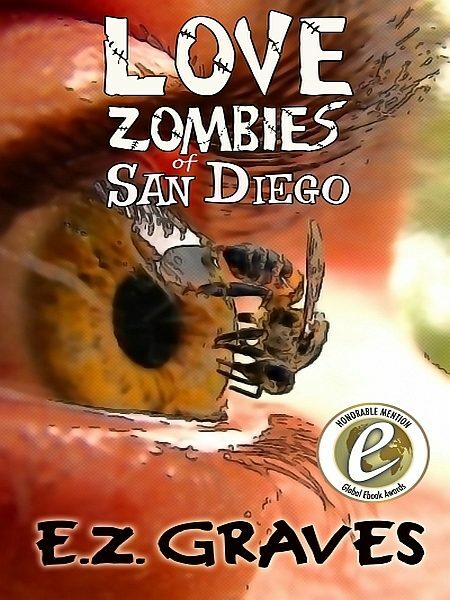 Love Zombies of San Diego by E.Z. Graves is a young adult zombie story that's a bit different. Josh is a zombie but he knows he's different from the grunting, mindless dead things he sees wandering all over the streets of San Diego. Josh doesn't breathe or have a heart that beats, but he does think, and brains are not his food of choice. He walks the streets, killing zombies with his trusty sword called Rockstar. Josh's concern that he might be the only one of his kind is dispelled when he sees Tasha, who's obviously confused and talking to herself. Tasha's a bit doubtful of Josh's theory that they are both Love Zombies, born of zombies and capable of thought and speech. They team up with other teenage Love Zombies and hatch a plan to find the source of the 'Old School' Zombies and eradicate them. Of course, I was intrigued by the title of E.Z. Graves' young adult horror story, Love Zombies of San Diego. Who wouldn't be? The story, however, exceeded my expectations. This is a literate horror/thriller that bashes greed, selfishness, agribusiness, and genetic modification, all achieved in a breezy and entertaining story. Sure, there's a lot of gore, brains, and hideous beings strutting their stuff, but you expected that in a zombie story, right? The difference between Love Zombies of San Diego and your typical Old School zombie story is that there's a great cast of characters. Include some philosophy and science thrown into the mix to get the picture why such an apocalyptic event might happen. The science neither talks down to the reader nor gets overly preachy. Love Zombies of San Diego is great fun and recommended for both young adult and adult readers. Genetic mutations that will boggle your mind. Vacation wonderland becomes zombie playground. When a mysterious zombie virus threatens the world, it?s up to teenage 'love zombies' to stop it. Musgrave supplies enough jugular-ripping, entrails-feasting carnage to satisfy any fan of the genre...Yet there?s also leavening humor, as well as unexpectedly resonant, emotional moments: When Josh drives a car and feels the steering wheel 'smooth in my hands,' he says, 'You don?t know what it means for us undead to be able to do something so human. I felt like I was one step closer, as Pinocchio would say, to being a real boy.' (T)he love zombies? satisfying triumph reaches icky levels of bloodletting that fans of the genre will appreciate. A vampire sequel looms on the horizon. Overstuffed--just how some fans like it. San Diego resident Jim Musgrave, who taught college English composition at Grossmont College in East County, has written a horror science fiction novel: Love Zombies of San Diego, using El Cajon and La Jolla as a backdrop. Reading like George Romero's Dawn of the Dead or the movie Blade with Wesley Snipes, The Necromancers: Or Love Zombies of San Diego, will certainly keep those who are horror or science fiction buffs entertained. The attention to scientific detail without reading like a textbook is one of Musgrave?s greatest strengths as a writer, and one that will surely become a trademark that his readers can look forward to finding in his future works.